Pakistan Telecommunication Company Limited’s (PTCL) landmark project of developing the youth through its Triple~E Program continues for the 3rd consecutive year. Batch 2 of the program was concluded successfully, where over 400 graduates from all across the country benefited. The Triple~E Program provides a year-long opportunity to fresh graduates for learning and development through hands-on training, live projects, job rotations, exposure to a fast-paced corporate culture and cutting-edge information and communication technologies. The program enables Enrichment, Encouragement and Evolution through a highly structured learning and engagement system implemented and improved every year, so that young graduates can compete in today’s highly competitive job environment confidently and professionally. The program is one of the most successful Corporate Social Responsibility (CSR) initiatives in the country. 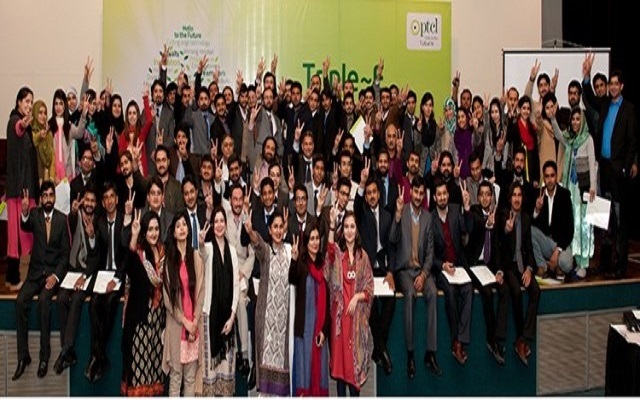 Recently PTCL held closing ceremonies for the second batch of Triple~E graduates in all major cities of the country. This year’s training included 198 learning sessions comprising of functional and soft skill training, nearly 600 individual live projects, more than 200 job rotations as well as regular feedback and career counseling sessions. Owing to the high quality of talent groomed, PTCL has already offered a healthy percentage of the top performers an opportunity to work as full-time employees with PTCL. So far nearly 200 interns have secured employment during and after the completion of their internship tenure. The third batch of Triple~E interns has also been selected from thousands of applications received and interviews undertaken across the country. The initiative reflects PTCL’s commitment towards corporate responsibility initiatives and vision of developing the youth.